Keith Farmer leads Andrew Irwin at Cadwell Park. Keith Farmer chalked up a sublime brace at Cadwell Park over the weekend to boost his prospects of a third British title. 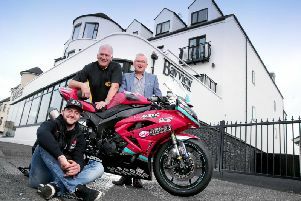 Farmer won the Supersport Sprint race on Saturday as his key challengers in the Championship failed to finish, with Dubliner Jack Kennedy forced out with a technical problem on the Tempus MV Agusta, while young Carrick rider Andrew Irwin crashed as he led Farmer by a slim margin with only two laps remaining. There was more drama in the Feature race on Sunday as Farmer caught the chasing pack napping after the Safety Car was sent out on lap four, following a crash involving Joe Francis on the Halsall Yamaha. As the Safety Car prepared to pull in on lap seven, Farmer wound back the throttle over the Mountain and immediately made a slight break. Irwin was caught out as he made a mistake through Hall Bends, with the Northern Ireland rider thrown off his ZX-6R. The incident forced the other riders to take evasive action and Farmer took full advantage as he opened a cushion, eventually closing out his second win of the weekend by 1.2 seconds over Kennedy, with Benjamin Currie (Gearlink Kawasaki) third. Eglinton’s David Allingham, who finished third in Saturday’s race, was fourth on the EHA Racing Yamaha. Farmer, who now leads the title standings by 63 points from Kennedy with four rounds remaining, said: “I started backing everyone up a bit and I knew they thought I would wait until the last corner, pretty much like everyone else does. “I let the Safety Car have enough of a gap so that at the top of the Mountain, I could go. I sort of made a half-look back and as soon as I turned around, I opened the throttle and then obviously carnage happened behind me. Meanwhile, Michael Laverty finished seventh and eighth in the two MCE British Superbike races on the McAMS Yamaha. Leon Haslam (JG Speedfit Kawasaki) edged the first race from Jake Dixon (RAF Reserves Kawasaki) by 0.131s. Shane Byrne was third on the PBM Ducati ahead of Peter Hickman (Smiths BMW) as the top four were covered by only six tenths of a second. In race two, Laverty’s team-mate James Ellison took victory from Smiths BMW duo Lee Jackson and Hickman. Byrne was forced out with a technical issue, while Dixon was a faller. Glenn Irwin, still struggling with injury, was 11th and ninth on the PBM Ducati, with Andy Reid twice finishing in 13th on the Tyco BMW. Silverstone hosts the final round ahead of the Showdown from September 9-10. In the Superstock 1000 race, Josh Elliott (Tyco BMW) finished fifth. Robert Kennedy (Sandown Kawasaki) was sixth in the Superstock 600 race, while in the Motostar class, Richard Kerr and Eugene McManus finished third and fourth in race one, and fourth and fifth respectively in race two.